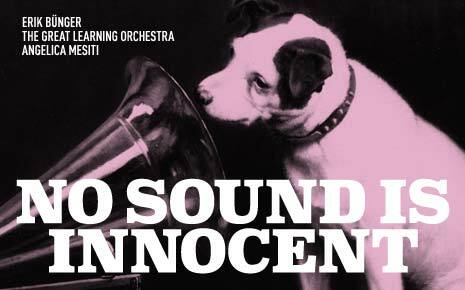 The Great Learning Orchestra will take part in the exhibition No Sound Is Innocent at Marabouparken Konsthall in Sundbyberg, Sweden. In the exhibition they will show what they are referring to as the a4 room, where one page graphic scores will be displayed, along with corresponding recorded interpretations of them. “a4 room is a cross-border project between visual art, composed music and improvisation which was initiated in 2004 by Leif Jordansson for The Great Learning Orchestra. It was initially an open invitation to contribute with a composition for orchestra, with the only restriction that it should be written to fit on an a4 sheet. Now it has now grown into an archive with more than 140 compositions made by artists and composers from different genres and from all over the world.” Included in the collection are by two scores by JG Thirlwell, as well as scores by LaMonte Young, Christine Ödlund, John Cage, Per Magnusson, Arnold Dreyblatt, Ebba Matz, Tony Harris, Hugh Shrapnel and many more. On the opening night, August 29 2014, participants of the Great Learning Orchestra will perform one of Thirlwell’s scores. The No Sound Is Innocent exhibition will also include Erik Bünger and Angelika Mesiti. The exhibition will run until November 30 2014.